The next morning (June 19) the weather was still perfect and we thus packed all our rock gear and walked over to the peak we had picked out. Carlos getting ready to climb the peak behind him. This time the approach was extremely simple as we just followed our tracks from yesterday to a rocky ridge which we initially climbed unroped. As the exposure increased halfway over we roped up, and Carlos lead about a rope-length of scramble mainly by just swinging the ropes back and forth between the rocks on the ridge. At the bottom of the steep wall, he established a belay and secured my passage across the ridge. 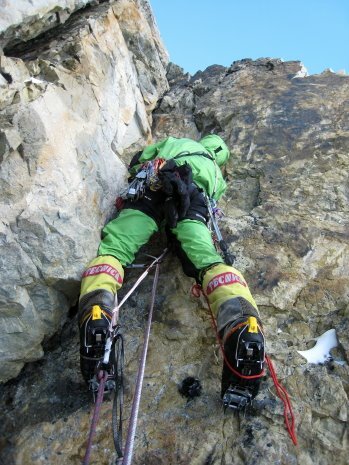 Carlos (in green Gore-Tex) building an anchor at the base of the steep climbing. Great view and great exposure! Next Carlos started leading what would become the first pitch following a crack system starting directly above the belay and then trending rightwards. Carlos taking the first step onto the vertical wall of pitch 1. The first pitch was climbed by a combination of drytooling, free climbing and semi-artificial climbing (i.e. resting on pro while figuring out the next moves). Eventually he disappeared around the corner to the South face at which point the rock got loose and he thus progressed slowly as he cleaned the loose rocks away. After ~4 hrs he yelled "Secure" and I followed as quickly as possible by a mix of free moves and pulling on gear. Carlos at the second belay. The next pitch initially followed a corner crack which was unfortunately too wide for our friends. There was not many other features to accept our pro but luckily there was several suspect looking chock stones in the crack which Carlos could then use as pro by putting slings around them. 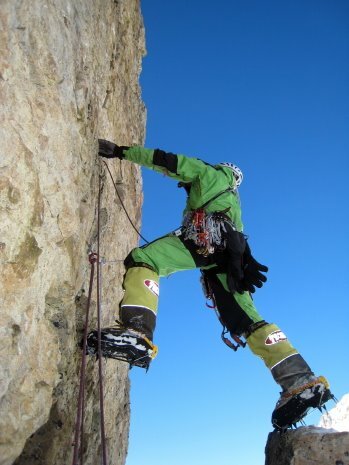 Given the wide crack and lack of features on the walls he decided to aid the first part of the pitch as there was not much to hold on to with his hands or icetools. Carlos aid-climbing pitch 2 with "on-the-spot-made" etriers. Once he got above the vertical wall, the steepness declined and the climbing got easier, but also loose again! It was thus slow and careful going. The sun was now setting, and I was thus very happy when I heard Carlos yell "I am on the summit!" Video from the summit of Aguja de Rune. Again I climbed as quickly as possible by a combination of free moves and pulling on gear - we wanted to get down before it got completely dark as we only had one headlamp with us! When I got to the summit we hugged and yelled "YES!" - we finally managed to climb a new route! What a great felling! 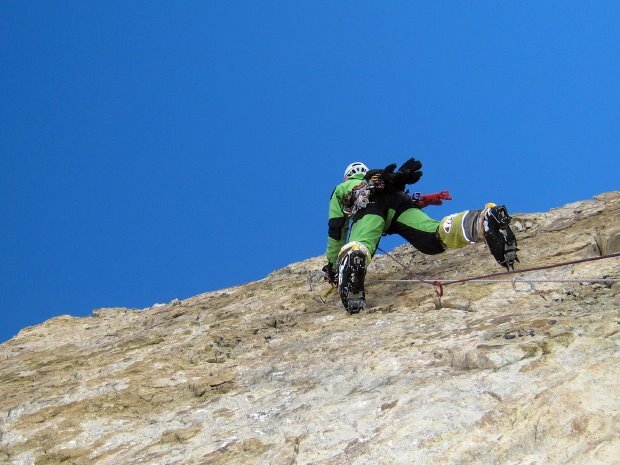 Video of Carlos rappelling from Aguja de Rune. While Carlos rappelled the route I was left on the summit in almost complete darkness. There was no wind or sound and I had the most spectacular 360° view with Cerro San Lorenzo glooming in the moonlight. 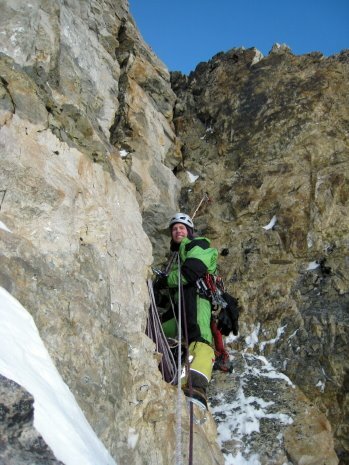 What a great feeling to just sit there for a few minutes enjoying the exhilaration of a first ascent! Rock needles seen from the summit of Aguja de Rune. Back in the tent we discussed what name to give the peak. Carlos and I met for the first time in 2003 while ice climbing in Rjukan, Norway. He was there with his wife, Christa-Lee Mitchell, and I was there with three of my Danish friends, Rune Klausen, Sune Hermit and Carsten P. Cooper-Jensen. 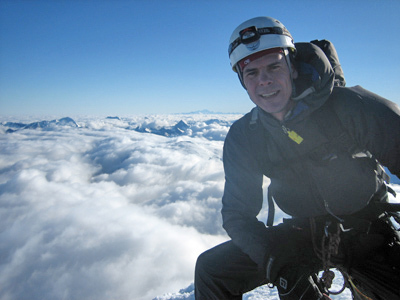 Regretable, Rune died in a rappelling accident on Pyramide du Tacul, Chamonix, France in August 2005, and given that we both knew him, I suggested to name the peak in his honour. 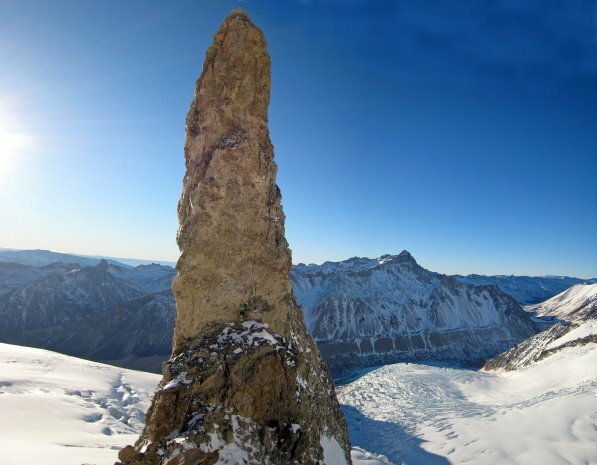 Carlos quickly agreed, and we thus named the peak Aguja de Rune (Rune's Needle in English, Aiguille du Rune in French). We also discussed which grade to give the climb. Free climbing in the summer in friction shoes it would probably be French grade 5c (US 5.8) and the way we climbed the route it involved aid A2+ and drytooling D5 sections. Aguja de Rune seen from the tent after our ascent. Summit of Cerro San Lorenzo is seen in the back in the upper righthand corner. The next day we descended into a valley on the Chilean side and then drove back to Buenos Aires to catch our airplanes. Read more about that in the next post: Cerro San Lorenzo part 6 - descent and route 40 home. Part 1: Cerro San Lorenzo - getting there. 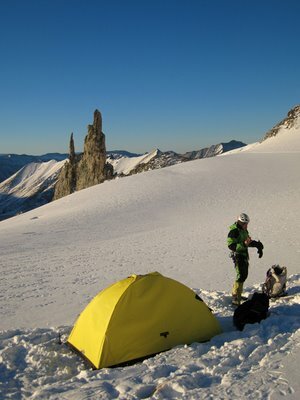 Part 2: Cerro San Lorenzo - advanced base camp. Part 3: Cerro San Lorenzo - life at Puesto Muñoz. Part 4: Cerro San Lorenzo - attempt on Cerro San Lorenzo.